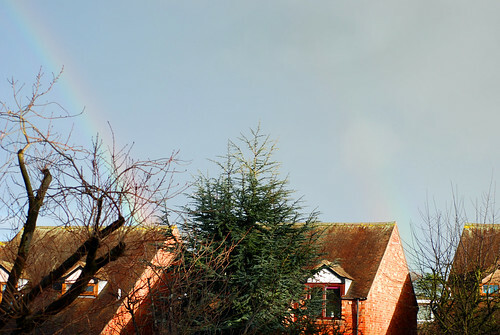 This gorgeous double rainbow (main bow to the left, second bow coming from the corner of the middle house) arrived on Saturday afternoon; I’m standing in a cloudburst to take the photo though clearly the neighbours are in full sunshine. We had a real proper downpour on Saturday morning, at least I think we did. With a bit of luck and a following wind, my Saturday morning routine involves H cooking scrambled eggs on toast for all of us and then a long hot bath as Kitty either naps or plays some game of her own invention which mostly seems to involve trying to poke at her father’s eyes sufficiently gently that she doesn’t get told off. It’s not always a roaring success and she often comes up to the bathroom to add her bath toys to my soak. Clearly, if you don’t have a boat, its dinghy, a diver, a sailor, a whale, three ducks and a wind up tug boat that goes round and round in circles in with you, it just isn’t a bath worth having. Saturday morning she snoozed and I sank up to my ears in steaming fragrant bubbles and listened to the raindrops smack against the window. Bath time is my reading time. Sometimes it’s an actual novel; a number of Persephone publications have found me turning on the hot tap with my feet (lever taps – best decision ever!) because I couldn’t put them down until a slightly shrivelled version of me had got to the end. 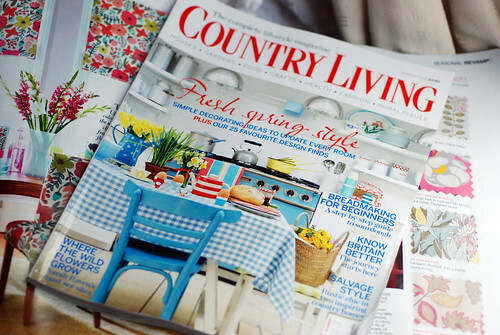 This week, I had a double bill of glorious house-indulgence glossies courtesy of Smiths who had a bundle offer on Country Living and House Beautiful. I read both. Cover to cover. Bliss. I’ll admit, I bought the magazine pretty much for this front cover; I’m gutted it was just a cover image, I want to know what the rest of that house looks like. It’s not exactly rocket science that I like it though; I already have a turquoise casserole dish, red weighing scales, and red spotty tea towels as the accent colours in my cream and brown kitchen. 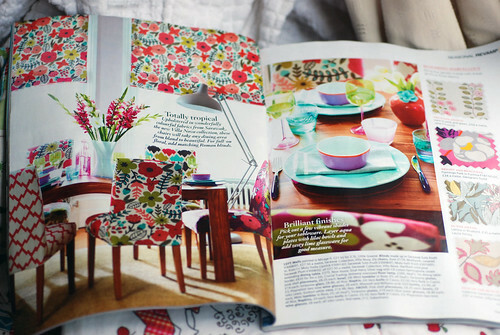 If we ever have that kind of space (and that kind of money), I have a longing for a turquoise range. Perhaps I should direct my aspirations towards the stripy teapot and spotty enamel jug. HB was full of riotous glorious colour; I would love to have the kind of space to be able to carry off such fabulous prints all mixed together, and the table setting, ah the table setting. It doesn’t surprise me that large chunks of it are Rice (who, amongst other things, make melamine plates and bowls in every colour under the sun and then some). 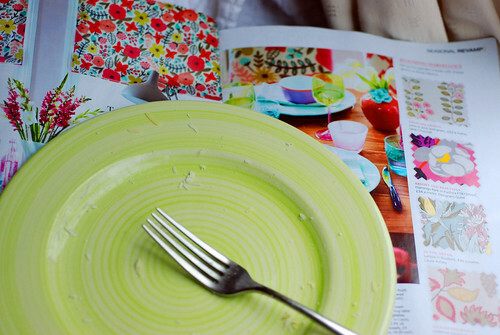 Maybe if we actually get a summer this year we should increase the eating outside/picnic plates collection? Actually my lunch plate (excuse the leftover cheese) looks like it would fit in pretty well so maybe there’s hope for us yet. As an antidote to the strong desire for a picnic,having been seduced by not one but two sets of beautiful pictures, and despite all factors being contrary to the plan (February, cold, windy, cloudburst, small dusting of snow overnight) I cleaned the kitchen, including a thorough scrub of the aforementioned red scales to make them all shiny and pretty and Country Living-worthy, and while we were doing the rounds at the supermarket, Kitty and I found the perfect thing to brighten up our kitchen windowsill; and I raided her toybox for a planter that makes me smile every time I see it. 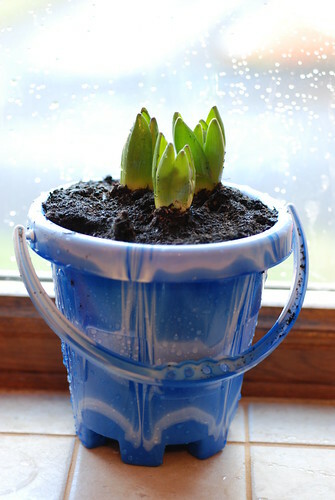 Soon-to-be-blue hyacinths in a castle bucket. I love it so much I’m thinking of getting another bucket for the basil plant. In red, naturally. Country Living has nothing on my style!